other than some light wear on cover there are NO markings on pages. Christine Barbour teaches in the Political Science Department and the Hutton Honors College at Indiana University, where she has become increasingly interested in how teachers of large classes can maximize what their students learn. She is working with online course designers to create an online version of her Intro to American Politics class. At Indiana, Professor Barbour has been a Lilly Fellow, working on a project to increase student retention in large introductory courses, and a member of the Freshman Learning Project, a university-wide effort to improve the first-year undergraduate experience. She has served on the New York Times College Advisory Board, working with other educators to develop ways to integrate newspaper reading into the undergraduate curriculum. She has won several teaching honors, but the two awarded by her students mean the most to her: the Indiana University Student Alumni Association Award for Outstanding Faculty and the Indiana University Chapter of the Society of Professional Journalists Brown Derby Award. When not teaching or writing textbooks, Professor Barbour enjoys playing with her dogs, traveling with her coauthor, and writing about food. She is the food editor for Bloom Magazine of Bloomington and is a coauthor of Indiana Cooks! (2005) and Home Grown Indiana (2008). She also makes jewelry from precious metals and rough gemstones and if she ever retires, she will open a jewelry shop in a renovated air-stream on the beach in Apalachicola, Florida, where she plans to write another cookbook and a book about the local politics, development, and fishing industry. Gerald C. Wright has taught political science at Indiana University since 1981, and he is currently the chair of the political science department. An accomplished scholar of American politics, and the 2010 winner of the State Politics and Policy Association's Career Achievement Award, his books include Statehouse Democracy: Public Opinion and Policy in the American States (1993), coauthored with Robert S. Erikson and John P. McIver, and he has published more than fifty articles on elections, public opinion, and state politics. 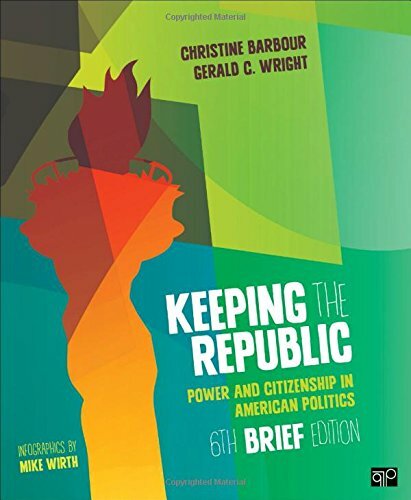 Professor Wright has long studied the relationship among citizens, their preferences, and public policy. He is currently conducting research funded by grants from the National Science Foundation and the Russell Sage Foundation on the factors that influence the equality of policy representation in the states and in Congress. He is also writing a book about representation in U.S. legislatures. He has been a consultant for Project Vote Smart in the past several elections. Professor Wright is a member of Indiana University's Freshman Learning Project, a university-wide effort to improve the first-year undergraduate experience by focusing on how today's college students learn and how teachers can adapt their pedagogical methods to best teach them. In his nonworking hours, Professor Wright also likes to spend time with his dogs, travel, eat good food, fish, and play golf.